Rich Gedman, a Clutch Single, and a Balk…21 Years Ago « It's a Kind of a Family. It's a Kind of Insanity. After the triumphant ride through Boston on duck boats, I followed Red Sox personnel into a post-parade reception at Fenway. 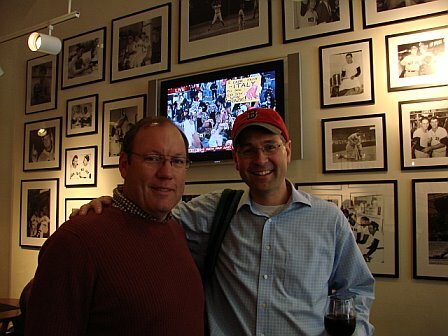 The place was crawling with familiar faces, but the one I was most eager to meet belonged to former Red Sox catcher, Rich Gedman. Gedman played for the Sox from 1980 to 1990, right in the prime of my Red Sox childhood, when I was between the ages of 12 and 22. I walked up to Gedman because I wanted to tell him that he had the key hit in the greatest baseball game I ever witnessed in person – and to ask him what he remembered about it. Rich was happy to talk. After introducing myself, I told Rich that I remember attending an extra-innings game at Fenway in my youth and, when it was over, I proclaimed, "I will never see a game more unbelievable than that for the rest of my life," and I recall that the opposing team made a couple of big blunders in the last inning to aid a Sox comeback, and that Gedman had the game-winning hit. But that’s all I recall. Rich said, "Yes, that was 1986, and it was against California, and we fell behind by three runs in the 12th or 13th inning, and I didn’t get the game-winning hit, I got the game-tying hit – a line drive to right field – then we won the game on a balk." YES! I said, THAT WAS THE GAME! 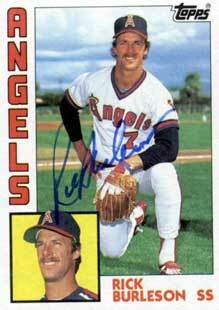 We then recalled that Angels 3B Rick Burleson dropped a pop-up that, had it been caught, would have ended the game. Rich tried to remember the name of the pitcher who balked, but he could not. (Further research reveals that his name was Todd Fischer… more on him later.) And Rich said that part of the reason he remembers the game is that, when the Sox made their miraculous comeback against the Angels in game 5 of the 1986 ALCS (thank you, Don Baylor and Dave Henderson), everyone in the Sox dugout was saying, "This is just like that game we played against them back in July!" Thanks to Google, I discovered that this game took place on July 10, 1986 (I was 17 years old), and the Red Sox won, 8-7. The entire box score and play-by-play detail is available here. And after reviewing how the game ended, I see why I knew I’d never see a more exciting game. In the 12th inning, the Angels and Red Sox scored a combined total of 7 runs with two outs. Here’s how it happened. In the top of the 12th inning, with the score tied, 4-4, Sox pitcher Steve Crawford retired the first two batters of the inning (Ruppert Jones and Gary Pettis) and then gave way to lefty Mike Brown to face left-handed hitting Wally Joyner. Mike Brown proceeded to implode. Joyner stroked a triple, then scored on a wild pitch. Unnerved, Brown then walked George Hendrick and Brian Downing in succession and gave up R.B.I. singles to Rick Burleson and Bobby Grich. Tim Lollar relieved Mike Brown and got **** Schofield to pop out to Gedman, but the damage had been done: three two-out runs for California and an almost certain loss for the Sox. As a kid, whatever tickets got my hands on were almost always standing room (and that was fine with me). I remember after that three-run burst, Fenway emptied and my little brother, Ben (16 at the time), and our friend, Sam (13 at the time), and I moved down to the front row behind home plate. We didn’t stay for the end of the game to see a Sox comeback, we stayed because we wanted to experience even a half-inning of Red Sox baseball from the good seats. We were sad the Sox were about to lose, but we were jacked to be sitting in the best seats in the house. Little did we know, we were about to witness history. Marty Barrett led off the bottom of the 12th against Angels pitcher Mike Cook with a single to the second baseman, Bobby Grich. In the box score it’s called a single, but in my memory, it was a botched play – perhaps it was a bad hop, I don’t know. Wade Boggs then did something he almost never did – he struck out looking. And after Bill Buckner flied out to left field, with the Sox down to their last out, Jim Rice did something he did frequently – he hit a ball into the screen above the Green Monster for a two-run homer. But when Don Baylor hit a pop-up above third base, it looked like the game would end — until the ball bonked off of Burleson’s glove and Baylor ended up on first. I remember that well – and I remember that Ben, Sam and I went nuts. Are we going to win this game?? And when Dwight Evans walked, putting the tying run on second base, the 1,000 or so of us left at Fenway jumped and screamed with anticipation. Number 10, Rich Gedman, shook the donut off of his bat and strode to the batter’s box with an expression of total calmness. And this is what I remember most about that game: seeing Gedman walk to the plate and thinking, "When this half-inning started, there is no way Gedman thought he’d be walking back onto the field again tonight." And I remember just praying, praying, praying for Rich to get a hit and continue this amazing comeback. And he did! Line drive, base hit to right field, Baylor scores. YES! YES! YES! TIE GAME! TIE GAME! Again, the loyal few of us left at Fenway, all crammed into the front five rows, romped and cheered like lunatics. RICH GEDMAN IS CLUTCH became a new fact in my baseball-encyclopedic head. And the winning run, in the person of Dwight Evans, stood at third base with two outs. 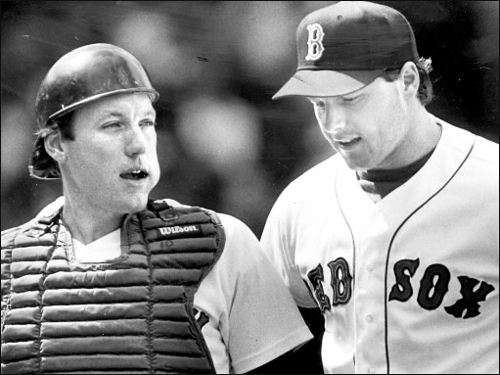 At this remarkable juncture, with the ever-dangerous Rey Quinones (lifetime batting average of .245) coming to the plate for the Red Sox, Angels manager Gene Mauch removed pitcher Mike Cook from the game and replaced him with rookie reliever, Todd Fischer. It was Fischer’s 9th major league appearance, and it turned out to be his last. And what a way to end a career – before even throwing a pitch, Fischer balked, Evans scored, and the Red Sox won. As Evans ran down the third base line, most of us in the stands didn’t know what had happened for a few seconds, but as the news spread, bedlam ensued. 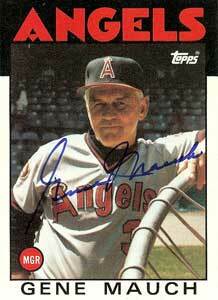 Gene Mauch argued vociferously while the Sox players and fans reveled all around him. As Ben, Sam and I walked out of Fenway that night, we all said to each other, that game will never be topped. Another interesting postscript to this story: soon after Mike Brown pitched like dog doo vs. the Angels and Rey Quinones stood there while the game-winning balk occurred, the Mariners traded 1986 heroes Dave Henderson and Spike Owen to the Sox for Rey Quinones and Mike Brown (and the immortal Mike Trujillo)! Thank you, Rey and Mike! And thank you, Rich Gedman, for the chance to reminisce about an extraordinary moment we both witnessed and participated in 21 years ago…. and that we’ll never forget. Impresive memory! I recall the game because 1986 was the year I graduated high school. My senior year, one teacher forced us to keep a journal of our thoughts and feelings as a way to get us to write every day. i didn’t really enjoy it at first, but by the time I got to graduation, I just kept going. By then, Clemens had the 20 strikeout game, the Celtics had won another championship (who knew it would be the last one? ), and I just loved keeping score in my journal. It’s a shame the 1986 team didn’t win it all. They had a bunch of guys that really made that year memorable. Hey, if you were 17, that makes us nearly the same age. Not bad.